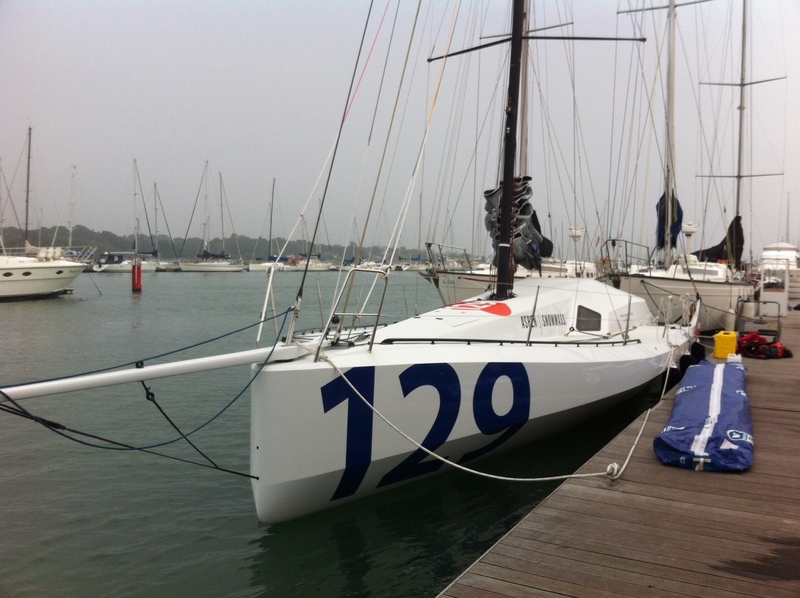 On a rather grey and damp afternoon, Paul Sumpner visited Class 40 race boat “Concise 8” which was being commissioned at Port Hamble. On board was Mark Wylie of Eastern Electronics who specialises in the supply and fit of marine electronics for high performance racing yachts. WIth NKE instruments, Adrena racing software running on Panasonic Tough Book Windows 8 PCs, AIS and Sat Comms, the installation was typical of the electronics that many serious offshore racing yachts are now fitting. To link everything together Mark had installed a Digital Yacht iNavHub and Paul was there to check the final network settings and advise on how one of Digital Yacht’s latest WL450 long range Wi-Fi antennas could be added to the system. With the Thrane and Thrane Fleet 250 Sat Comms, connected to the WAN socket of the iNavHub, the NMEA 0183 instrument and AIS data coming in to the NMEA input of the iNavHub and the Tough Books, iPads and smart phones connected wirelessly to the iNavHub network, it was possible for all wireless devices to receive NMEA data and connect to the Sat Comms to download weather data, etc. What is more, using a piece of software called Real VNC, Mark was able to run the main PC down below and fully control and repeat the Adrena racing software from on deck with the Panasonic Tough Book – all through the Digital Yacht iNavHub. When Digital Yacht developed iNavHub we had not considered Racing Yachts to be a potential application and it was great to see Mark using our iNavHub in this new and exciting way. Despite the weather, the visit was a success and it was good to see everything working as planned. For more information on Team Concise click here.